Are you ready to go virtual to free up your time and achieve increased results? Virtual teams allow you to focus on what you do best, while delegating ‘the rest’. 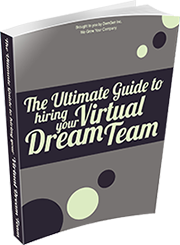 In this comprehensive guide, you will learn how your business, productivity, results and life can be improved by working with a virtual team. Why hire a full time employee when you don’t really need one? Working with a virtual team allows you to delegate on a task-by-task or project-by-project basis – to experts who specialize in the specific services you require. Where and How to Start Looking?